This 7 December 2018 video from the USA is called South Park Roasts Amazon & Jeff Bezos Explained. Events, including reports of brutal, dangerous working conditions and dire poverty faced by Amazon workers, have apparently not passed unnoticed by the creators of the popular cartoon comedy South Park on the US television cable channel Comedy Central. 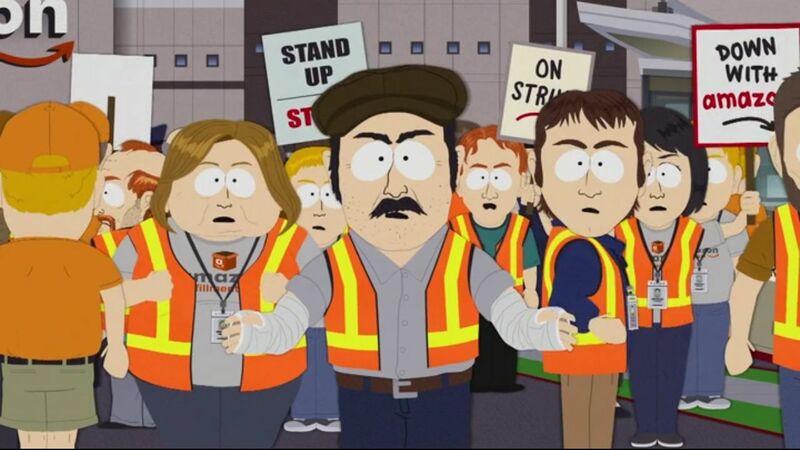 Two related episodes of South Park (which has been on the air since 1997), Unfulfilled and Bike Parade, aired in December, sympathize with Amazon workers while depicting billionaire owner Jeff Bezos as a villainous and murderous alien (from Star Trek) bent on the enslavement of humanity. The scene is sincere, effective and well-crafted. The Fulfillment Center has wiped out other businesses in the small fictional town of South Park, Colorado, driving their former owners to find work with Amazon. The recently revitalized downtown area is blighted; the mall is filled with zombies—grim shades of the retail industry—now starved of all human contact. A Fulfillment Center section manager named Josh is run over and mangled by sorting machines, ending up plastic-wrapped and crammed into a small cardboard shipping container. A statement from Amazon blaming “human error” for the mishap enrages local bar patrons, including Amazon workers, who angrily declare a strike. Battles on the picket-line ensue. Reporter: And, Josh, how does it feel to have your accident spark so much upheaval? Josh: You know, Tom, I think something like this was bound to happen. There’s those at the top who control the means of production, and then there’s the working class that enables those means by selling their labor power for wages. When there’s conflict, the ruling class tries to blame the working class. Reporter: Can you get out of the box? Josh: No, my organs have been compacted, so if the box opens, I spill out and die. I believe the working class needs to revolt against capitalism and bring about socioeconomic emancipation. Reporter: Do you get hot in the box? Josh: [To Randy Marsh] Do you care that personal worth is being reduced by capitalists to exchange value?! Randy Marsh: Oh, yeah [sarcastically]. That’s typical rhetoric from a Marxist box. Josh: Free trade is not free-dom! Perhaps socialism is the answer! Reporter: If you pay for shipping, can you go anywhere you want? On the other side of the equation, multi-billionaire Amazon owner Jeff Bezos takes the form of a Talosian, an alien from the proposed 1965 pilot (not broadcast at the time) of the original Star Trek television show. In that episode, the large-headed and deceptive Talosians lure the space vehicle Enterprise to their planet, Talos IV, with a phony distress signal. The once proud race of Talosians has nearly eradicated itself through war, and the want to use the Enterprise crew as host organisms. The complete and consuming type of exploitation that the Talosians have in store for the Enterprise crew serves as a scathing metaphor for what Jeff Bezos does to Amazon workers—deceive, deplete and discard them. On South Park, Bezos sports the characteristic Talosian bulbous head, only with a more pronounced cleavage in the rear, resembling buttocks. He is eager to return to the planet Bezos where he can “touch butts” with his wife, he tells the mayor before threatening to revoke her Amazon Prime membership should the strike persist. His telepathic condescension captures the chilling indifference of a person who, along with two other individuals, has come to possess more wealth than the poorer half of the US population. While the tone of Unfulfilled and Bike Parade is undoubtedly ironic at times, and the situation has its absurd features, there are comic elements that give expression to certain inescapable facts, including the return of social conditions that prevailed in the 1930s, and with them a renewed working-class militancy that threatens the existing order. For this, South Park creators Trey Parker and Matt Stone deserve some credit. Unsurprisingly, Parker and Stone seem torn, or at least confused. The episodes, if one takes them at face value, ultimately tend to reduce “Marxism” to an all too familiar “radical” critique of consumerism (the addictive desire to receive “stuff” from Amazon). And in the end, marijuana produced by a local farmer restores the town’s (vaguely stoned) solidarity and thwarts Bezos. This rings almost like a confession from Parker and Stone that, beyond a certain point, they are in over their heads. The prevailing message in South Park has tended to be that “ordinary” people are rather stupid and therefore more or less deserving of what befalls them. So the satirical treatment of a modern robber baron, coupled with the sympathetic handling of a fiercely exploited and newly combative work force, is a healthy and welcome development. Wherever South Park goes from here, the Amazon episodes are worth viewing. Amazon CEO Jeff Bezos and his wife, MacKenzie, are to divorce after a 25-year marriage: here. Amazon hires public relations firm to counter popular hostility to headquarters project in New York City: here. This entry was posted in Economic, social, trade union, etc., Human rights, Media and tagged USA by petrel41. Bookmark the permalink.